In years past, our Great Pyrenees guardian dog Claymore guarded the goats and kept them safe from roaming predators. Caitlin has been raising goats and making cheese for 27 years; Brad married into it 18 years ago, and without him, the farm wouldn’t function. 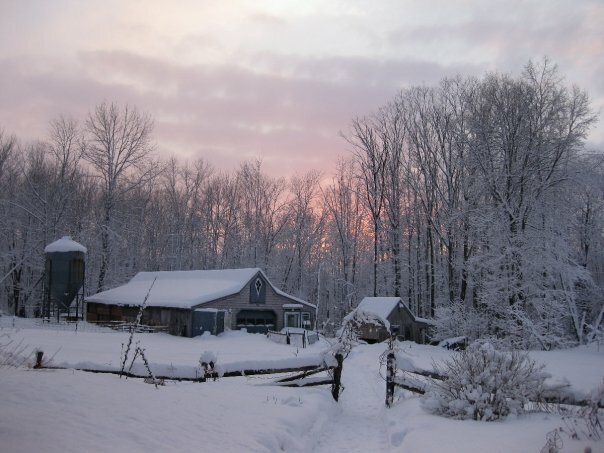 After making cheese for many years on a home scale, we received state licensing in 1994, and have continued to expand our commercial cheesemaking operation, producing about 6000 pounds of cheese last year. Our 17-year-old daughter Fiona is a Capricorn (what else?) and is a great help around the farm and at Farmers’ Market. 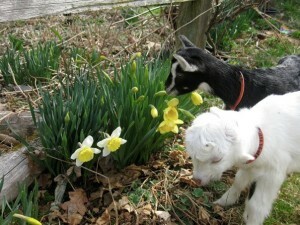 In 2006 over 60 kids were born, welcoming spring with their antics and boundless energy. 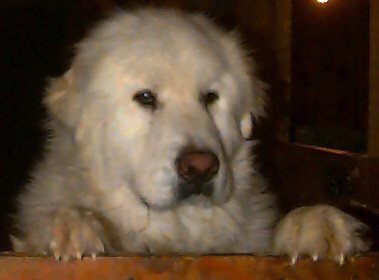 In years past, our Great Pyrenees guardian dog Claymore guarded the goats and kept them safe from roaming predators. Our helping circle around the farm includes Cait’s sister Megan Cafferata, who manages soap production and marketing, and in recent years, an apprentice who helps with cheese production and farmers markets. We opffer cheesemaking apprenticeships. This is a serious full-season, full-time position, and only the serious need apply. Please see our Apprenticeship Pages and check the MOFGA (Mine Organic Farmers & Gardeners Association) website for a farm description, then email for more details. No phone calls, please.